You are given that the perimeter of an equilateral triangle is meters. What is the length of one side of that triangle? By definition, an equilateral triangle has three congruent sides. The perimeter is the sum of those sides. Thus, to find the length of just one of those sides, we can divide the perimeter of the triangle by three. divided by is meters, which is our answer. An equilateral triangle has a side length of . What is the triangle's area? The area of an equilateral triangle is found using the following formula. The area of square ABCD is 50% greater than the perimeter of the equilateral triangle EFG. If the area of square ABCD is equal to 45, then what is the area of EFG? If the area of ABCD is equal to 45, then the perimeter of EFG is equal to x * 1.5 = 45. 45 / 1.5 = 30, so the perimeter of EFG is equal to 30. This means that each side is equal to 10. We then apply the formula for the area of a triangle, which is 1/2 * b * h. We get 1/2 * 10 * 5√3 = 5 * 5√3 = 25√3. In general, the height of an equilateral triangle is equal to √3 / 2 times a side of the equilateral triangle. The area of an equilateral triangle is equal to 1/2 * √3s/ 2 * s = √3s2/4. What is the area of an equilateral triangle with sides 12 cm? An equilateral triangle has three congruent sides and results in three congruent angles. This figure results in two special right triangles back to back: 30° – 60° – 90° giving sides of x - x √3 – 2x in general. The height of the triangle is the x √3 side. So Atriangle = 1/2 bh = 1/2 * 12 * 6√3 = 36√3 cm2. The length of one side of an equilateral triangle is ten. 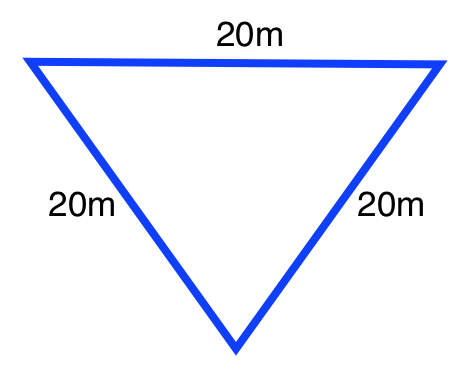 What is the area of the triangle? To calculate the height, the length of a perpendicular bisector must be determined. If a perpendicular bisector is drawn in an equilateral triangle, the triangle is divided in half, and each half is a congruent 30-60-90 right triangle. This type of triangle follows the equation below. The length of the hypotenuse will be one side of the equilateral triangle. The side of the equilateral triangle that represents the height of the triangle will have a length of because it will be opposite the 60o angle. To calculate the area of the triangle, multiply the base (one side of the equilateral triangle) and the height (the perpendicular bisector) and divide by two. What is the area of an equilateral triangle with a side length of ? In order to find the area of the triangle, we must first calculate the height of its altitude. An altitude slices an equilateral triangle into two triangles. These triangles follow a side-length pattern. The smallest of the two legs equals and the hypotenuse equals . By way of the Pythagorean Theorem, the longest leg or . Therefore, we can find the height of the altitude of this triangle by designating a value for . The hypotenuse of one of the is also the side of the original equilateral triangle. Therefore, one can say that and . 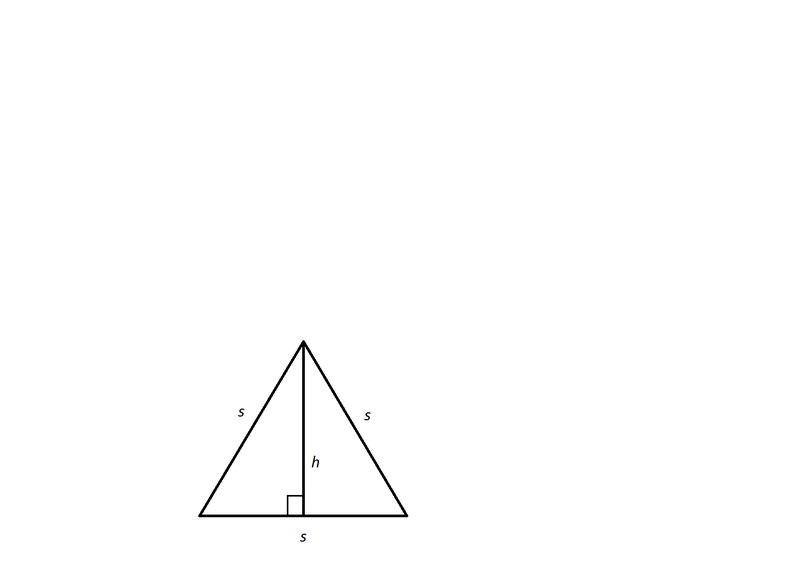 Now, we can calculate the area of the triangle via the formula . An equilateral triangle has a side length of find its area. Triangle A: A right triangle with sides length , , and . Triangle B: An equilateral triangle with side lengths . Which triangle has a greater area? The areas of the two triangles are the same. There is not enough information given to determine which triangle has a greater area. To determine which of the two areas is greater without using a calculator, rewrite the areas of the two triangles with comparable factors. Triangle A's area can be expressed as , and Triangle B's area can be expressed as . Since is greater than , the product of the factors of Triangle B's area will be greater than the product of the factors of Triangle A's, so Triangle B has the greater area. What is the area of an equilateral triangle with side 11? you need to find the height of the triangle first. Because of the 30-60-90 relationship, you can determine that the height is . Then, multiply that by the base (11). Finally, divide it by two to get 52.4.